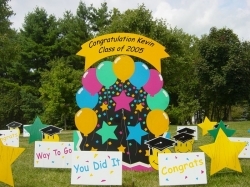 Our Yard Signs - "Graduation"
FTD, eat your heart out! Our flowers are bigger, and never wilt! Our ´all occasion´ card flies high for Graduations, Sport/Academic accomplishments, Welcome Home, and of course Birthdays. For that person who ´insists´ that they don´t want a ´Big Production´ made of their special day.